It was most welcome news when the website Tunisialive reported on March 4th that after nearly two years in prison, Jabeur Mejri had been freed. Barely two months later, Amnesty International is now reporting that Jabeur has once again been sentenced, this time been to 8 months for ‘insulting an official’ and ‘violating sacred values’. 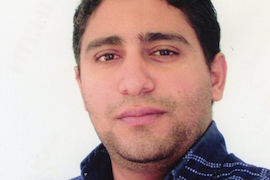 Our previous update on Jabeur has the full story of his first imprisonment, as well as names and addresses of Tunisian officials you can write to to express your support for Jabeur.